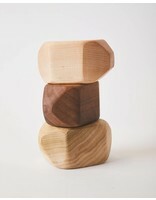 Clover + Birch Balancing Blocks. Modern design and natural materials perfect to shake, stack, or soothe. All wood is locally sourced and each piece is hand-crafted. A coconut and beeswax blend is used to seal each rattle.